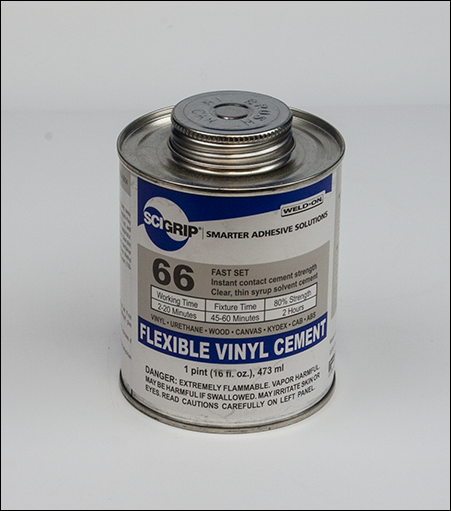 WELD-ON 66 is a clear, light bodied, fast drying solvent cement. It is used as a contact cement, providing instant, high strength which will increase as solvent dissipates. The longer the open time (5 to 10 min) and with sufficient assembly pressure, the greater the immediate strength will be. WELD-ON 66 may also be used on surfaces that are wet to wet or wet to dry; but its special advantage is its high initial strength on contact. Whatever the bonding technique used, it will provide high strength, long lasting, water resistant bonds under normal use, but some yellowing may be expected.